Having a few pieces of wood lying around the house could make you consider throwing them away. However, before you do, you have to think about turning that wood into something useful. You should consider recycling or reuse it for another purpose. In what follows, we will offer you a few ideas on how to develop some DIY reclaimed wood projects. If you are left some wooden panels since you have redecorated the house, do not throw them away. Use the panels, repaint them and create a headboard for your bedroom. You will develop a romantic-rustic and distressed headboard appeal transforming your bedroom into the kingdom of coziness. If you are a wine lover, this DIY reclaimed wood project could be just the right thing for you. Do you need a vintage wine rack for your bottles? Then make sure you find some wooden pieces lying in your garage and start working. Furthermore, if you are a talented designer, it means that your deconstructed pallet boards are just waiting in a corner to transform into works of art. Even if this might be a bit complicated and probably one of the most sophisticated DIY reclaimed wood projects on the list, it is definitely worth it. It will necessitate a lot of work, but this project will also stimulate your creativity. You can paint the wooden pallets in whatever colors you’d like, and you think that match with the rest of your furniture. If painted in blue, the wooden coffee table will offer your living room an air of shore-side relaxation. If your porch misses its spark, then you should consider adding a bit of color. Use some wooden pallets to build a patio table. You just have to stack the pallets and nail them together to develop this table. It will look perfect on your porch, becoming part of your fun summer nights. Your living room will look cozier if you develop a sofa table from some repurposed wood. The brass drawer hardware and the intricate woodgrain would make it look more like an heirloom instead of a repurposed wood project. This is a very creative idea, offering you the chance to paint the wooden pallets into the most vivid colors. In this way, you will offer a joyous look at your living room. If you don’t want to repaint the whole house or room, but you have some wooden pallets lying around, here is what you can do. First, use your favorite colors to re-paint the wooden pieces. Then, consider developing a pallet board project that covers one of the walls. Besides the colorful chaos, you will also combine artistic order to develop this eco-friendly board that looks incredibly beautiful. For this, you will need five planks of repurposed pallet board across the top, interchanging with some slimmer pieces cut from pallet planks. You can coat the tabletop with a food-safe wax to offer it a dark luster and enjoy its functionality in the kitchen. 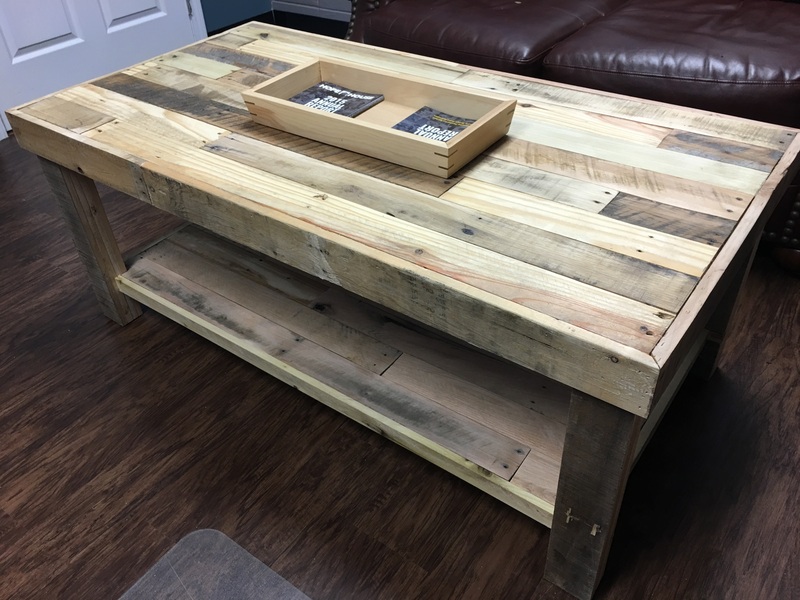 You can reuse the pallet wood you have to build an exquisite coffee table for your living room. The wide wood slats of wooden pallets are perfect when you want to develop a bench. Furthermore, developing a porch swing is an even better idea. You will only need two pallet boards to develop a sturdy swing. Your backyard will be cozier with this backyard accessory. This farmhouse table adds growth to its design since you can even plant some succulent greens right in the middle. Developing this table would be a great way to use repurposed wood. If you have rustic furniture in your kitchen, this stove vent hood would really complement it. Use some wooden pallets to bring together innovative design and the cottage style. This might be the easiest one from our list of DIY reclaimed wood projects. If you enjoy reading or having a glass of wine while relaxing in the bathtub, this is just the right thing for you. From now on, your bath time would be more enjoyable. You will only need some screws, wood stain, wood sealer, scrap wood, pallet and some safety supplies. You can easily build this functional DIY décor our of pallet wood. Keep in mind the fact that you also need some chicken wire which is perfect for the kitchen. In this way, you can leave important notes to your family and friends on this fun board that will perfectly match your rustic kitchen. This is a cute way to praise your coffee mugs that will hang on your kitchen wall. Make sure you have a few piece of pallet wood and some nails and start working. Besides the fact that is easy to make, you can also make more room in your kitchen cupboard. This mug organizer is perfect for every coffee lover, adding an artistic air to your kitchen wall. Feel free to decorate the cup holder using paint. If you have some piece of old barn wood lying around, you can offer them a new purpose. Build up this house number sign and add the numbers to the wood using some paint. This will look tasteful in your yard if you hang it from a tree. If you love art as much as you love jewels, then you are likely to enjoy building this pallet wood jewelry holder. You can nicely arrange your jewelry here, hanging all your precious necklaces and bracelets. To offer it a vintage vibe, you could dry brush different paint colors on the pallet wood. All these DIY reclaimed wood projects can help you get rid of the piece of pallet wood you have without throwing it away. Make sure you have all the supplies and the tools you need and start working. These eco-friendly pieces of furniture will give a rustic and vintage taste to your home.